We live in the age of scientific optimism. Tomorrow’s new knowledge will vastly expand our understanding of ourselves and our mastery of the world. The flip side of scientific optimism, however, is that today’s knowledge is fraught with gaps and errors of which we are not yet aware. Furthermore, knowledge and understanding do not always grow gradually like the rings of a tree. Conceptual jolts and surprises fill the history of discovery, invention and innovation: the world is not flat; the heavens are not immutable; motion is not absolute; light is an electromagnetic phenomenon; flight is not limited to bugs and birds; biological species are neither perfected nor immutable; the human psyche harbors dark thoughts and hidden desires; there is intelligent life on Mars (not yet, but imagine how surprised we’ll be). Our profound confidence in knowledge-based progress entails a dilemma: a new and innovative idea or object is putatively better than its precursor, but is often more uncertain precisely because of its newness. What if innovative looks better, but it might be much worse. We cannot know today what we will understand tomorrow about today’s discovery or invention. This innovation dilemma needn’t undermine our scientific optimism, but we must manage the continuous upheaval of knowledge. Let’s consider a few examples of innovation dilemmas: e-reading, disruptive technology, attempts in ending terrorism, and the habit of open-mindedness. Digital tablets are versatile interactive graphic devices. They display pictures, project voices, show movies, store data, and link to user-chosen options and to the world. Is the tablet a good device for teaching young children reading and other language skills? The possibilities are great; tablets are fun and enable access to vast resources. But reading a tablet is different from reading a printed book. That’s precisely the attractive promise of this new technology. But are all the differences beneficial? To use or not to use this new device is an innovation dilemma. The new technology has tremendous purported and evident advantages over the familiar printed book. Its difference is its attraction, but also the source of concern because the impacts of those differences may be far worse than anticipated. The long-range impacts are poorly understood or not known at all because the device is new. At some point in the future the dilemma will vanish because we’ll know as much about e-reading as we now know about print-reading. But today we face an innovation dilemma. Many successful firms maintain their standing by monitoring and responding to their customers’ needs, and by actively investing in new technologies or methods that sustain and extend the utility of their products to those customers. The continual improvement in data density of computer disk drives is an example. The core customers of the computer industry valued this sustained improvement, and the leading firms maintained their standing by responding to this need. Established customers can say what they need, but they cannot say what they don’t yet know that they need. A disruptive technology builds on a new market by offering a new capability that established major markets don’t (yet) need. The history of the computer industry illustrates that a disruptive technology identifies and nurtures a small potential market that is ignored by leaders in the industry. The innovation dilemma facing the successful manager is that a disruptive technology could peter out or it could overwhelmingly supplant existing technologies, and insufficient market data and insight are available to confidently predict which it will be. The West faces serious terrorist threats from numerous radical Islamic organizations, including al-Qaeda and its off-shoot, the Islamic State. The split between al-Qaeda and the Islamic State derived from clashes of personality, strategy and tactics. The killing of bin Laden weakened al-Qaeda, and one would expect a similar impact on the Islamic State. However, the death of either leader would remove a major obstacle to the re-unification of these organizations, and could thus lead, inadvertently, to a strengthening of the world jihadist threat. The radically innovative strategy of leaving the leaderships intact could have a far better outcome than the standard approach of eliminating a charismatic leader of a terrorist regime. However, not attacking a ruthless and brutal terrorist organization could reverberate globally, among both friends and foes, in ways that are very difficult to predict. The innovative strategy is less familiar and more uncertain than the standard strategy. The innovation could be much better or far worse than the standard decapitation strategy. The paradigm of the innovation dilemma characterizes this situation even though new technology is not involved. Habits are valuable, though they may also be detrimental. The habit of open-mindedness is a case in point because it constitutes an innovation dilemma. Without the habit of believing that past patterns will recur, we would be incapacitated and ineffectual. Who would dare climb stairs or fly planes without the belief that, like in the past, the stairs will bear our weight and the wings will carry us aloft. Without habits we’re lost in an unknowable world. And yet, openness to new ideas, tastes, sounds and other experiences can itself be a habit, and perhaps a good one. It is the habit of testing the unknown. The habit of open-mindedness is paradoxical. On the one hand habits are conservative. We repeat past practices by habit. On the other hand, the habit of open-mindedness can bring us to abandon our former habits, perhaps even abandoning the habit of open-mindedness. This paradox is an innovation dilemma. Openness to new things, ideas, and behaviors is potentially beneficial but possibly dangerous, where the uncertainty results from the newness. Habits, including the habit of open-mindedness, seem to be a good thing even though we can never know for sure how good or bad they really are. The paradox of our enthusiasm for today’s innovations is that tomorrow’s discoveries will reveal today’s ignorance about those innovations. The challenge is in deciding today whether to use or abandon an enticing innovation. Featured image credit: ‘People Boy Ipad’, Public Domain via Max Pixel. Yakov Ben-Haim is a professor of mechanical engineering and holds the Yitzhak Moda'i Chair in Technology and Economics at the Technion - Israel Institute of Technology. 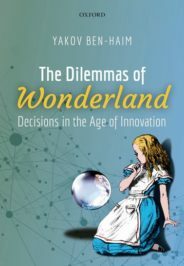 He initiated and developed info-gap decision theory for modeling and managing severe uncertainty, and is the author of The Dilemmas of Wonderland: Decisions in the Age of Innovation (OUP, 2018).